A screenshot of the new Uber-style snow service’s title page. An Uber-style company with its sights set on disrupting the snow industry has launched. 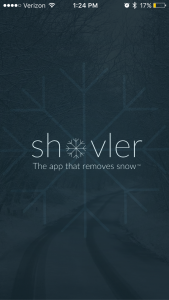 The new app is called Shovler. Since its December launch, more than 1,000 people have already registered to push snow for the company, The Penny Hoarder reports. The app is available nationwide, but it’s mostly been used in the metro and suburb areas of Chicago, Cleveland, New York, Philadelphia and Boston. Its inception came after company CEO Daniel Miller struggled to find a one-off, on-demand plow during a vacation in Florida. “It just dawned on me that there are lots of people in similar situations, especially the elderly, that just want to hire a snow shoveler on demand for the days they need one or want to take a break from shoveling themselves,” the New Jerseyite told The Penny Hoarder. 50 cents-$2 per square foot for a city sidewalk or parking lot. The company takes 15 percent and the rest goes to the shoveler. The app, which is available on iOS and Android, is also like Uber in the sense that nonprofessionals can easily sign up and get gigs. The only stipulation is they must be registered by the company before they get started.